Jasmin Hernandez of The Creators Project, a venture on art and culture by VICE, discusses Every Curve Zoë Buckman’s latest completed body of work being shown at PAPILLION ART in Los Angeles, on view through April 30, 2016. 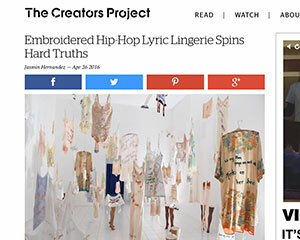 An installation comprised of vintage lingerie, hand-embroidered with lyrics from celebrated rappers, tackles the position of subordination women have long held in hip-hop culture. In an ingenious fashion, artist Zoë Buckman’s exhibition, Every Curve, juxtaposes the genre’s often crude attitudes towards women with utterly feminine articles of dress, resulting in thought-provoking objects.